6 Roses beautifully arranged in a bouquet interspersed with Silver Dollar are a great way to express all kinds of feelings. Our Roses come in a range of different colours, so make sure that you specify what colour you want when ordering. Pick the colour that best expresses what you feel. Vase not included however; to add to the element of surprise, may we recommend including a Premium Vase with your order? flowers great. delivered perfectly & on time. Order was extremely easy, making an amendment to my order was not only quick to be responded to, but also painless. And delivery was well done even though it was not on the date I requested. Thank you so much for the wonderful service! Was a lovely service and highly appreciated. Thank you. I appreciated the reminder email however one would have been enough. Receiving a reminder email every day for several days leading up to the event became rather irritating. 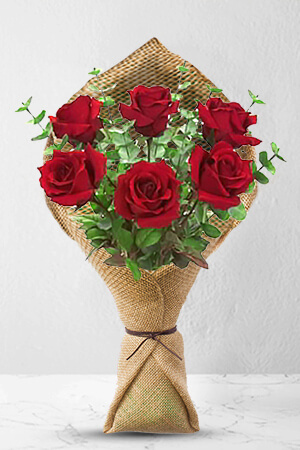 It is my first time to place my order through zflowers.and I am satisfied .the service is excellent.